BP Georgia, as part of the BP family of companies, coordinates local operations for BP. It is heavily involved in regional energy projects particularly in the Caspian basin and has expanded its activities into Georgia with the onset of major pipeline construction. KPMG is a Big Four company, a global network of professional firms providing Audit, Tax, and Advisory services, operating in 155 countries and having more than 174,000 people working in member firms around the world. KPMG's purpose and aspiration is to turn knowledge into value for the benefit of its clients, people, and the world’s capital markets. PwC's purpose is to build trust in society and solve important problems. PwC is a network of firms in 157 countries with more than 223,000 people who are committed to delivering quality in assurance, advisory and tax and legal services. PwC has been serving clients in Georgia since 1996, and in July 2005, opened the office in Tbilisi which now employs 75 professionals. UGT is one of the leading system integrator and solution provider on the Georgian IT market. UGT primarily concentrates on providing services to corporate clients and the government sector. The core business of UGT is the implementation, deployment, and support of solutions that are based on information and communication technology products and services. UGT is also known for the provision of high quality computer equipment and accessories. Among the partners and suppliers of UGT are world leading IT companies such as Microsoft, SAP, HP, Cisco, IBM, AVAYA, SUN, Oracle and other. JSC Alliance Group Holding is the leading finance company, promoting economic growth and creating opportunites for investors, people and businesses in Georgia investing in the most sound and perspective projects. LTD "Alliance +” was founded in 2005. In 2008, as a result of rebranding the company continued its work with a new name "Orbi Group”. In the same period of time company launched a project "Hotel type residential house”. The product created by the company became one of the most demanded projects in Georgia and outside of its borders, it also became a milestone in attracting investments for the city of Batumi. The founders of "Alliance Group” – in cooperation with "Orbi Group” and other companies, have built more than 20 residential complexes and Aparthotels, 5000 apartments, more than 1200 000 sq. m. construction area, which undoubtedly proves the vast experience company has acquired. Alliance LLC creates exclusive, premium class residential complexes, comfortable, and economically profitable for clients as well as for the country; Residential complexes that meet international standards by the quality of construction and materials used and by the infrastructure and services provided. American Medical Centers is a regional health services provider that owns and manages ambulatory care and outpatient care facilities in Eastern Europe and Eurasia. AMC employs more than 150 professionals and medical healthcare associates, providing direct patient care, emergency assistance and access to all medical specialties, from Cardiology to Neurosurgery. American Medical Centers enjoys affiliations with leading hospitals around the world, including Yale - New Heaven Hospital, and New York Presbyterian Hospital, where AMC is designated as an affiliate hospital. All American Medical Centers and partner facilities are recognized by the worlds leading healthcare institutions and are fully licensed hospitals and clinics. American Medical Centers is dedicated to providing the highest standard of health available using the latest diagnostic and therapeutic protocols from the United States and European Union. The company is committed to providing evidence-based medicine, practiced by the best-trained clinicians available, in a clean, safe facility, where quality-assurance is paramount. The Anaklia Development Consortium (ADC) is developing the Anaklia Deep Sea Port and the Anaklia Free Industrial Zone in the Black Sea Region to breathe new life into the ancient Asia-Europe trade route. Both developments are granted through an investment agreement provided by the Ministry of Economy and Sustainable Development of Georgia for the rights to develop, finance, design, construct, operate, market, manage, and grow the Anaklia region. ADC embraces the Silk Road vision to accelerate Georgia's GDP growth and create jobs for its people. The Anaklia Port will be a lasting economic driver for Georgia, both as a national asset representing Georgia's historic significance and its vital role in the evolving global economy. Best Western International is the world's largest hotel chain with more than 4000+ hotels in 100 + countries and territories. It is a membership association of independently owned and operated hotels that provide marketing, reservations and operational support to its member hotels. Being the member of the Best Western Brand, Best Western Tbilisi Hotel offers 48 spacious and comfortable guest rooms with all the facilities and amenities you would like to enjoy while traveling. Centrally located in the busy part of the city center, hotel is surrounded by offices, adjacent to shopping street and main attractions. In addition to spacious and comfortable guest rooms Best Western Tbilisi offers on-site Restaurant and Bar, Spacious Meeting facilities with state of art technologies, 800 sq. meter vast fitness center and variety of treatment rooms. Guest can use the underground garage that is conveniently located on -2 level. Stay at Best Western Tbilisi while on business or leisure trip. Betsy's Hotel is an exclusive guest house located just minutes away from Rustaveli Avenue, Tbilisi's premier district. With rooms in the traditional Caucasian style, Betsy's Hotel is an oasis of comfort with the feel of Georgia. Blox for "Hampton by Hilton"
Blox Real Estate Development Company was founded in Republic of Georgia and concentrates its activities in Tbilisi for this moment. The company designs and builds comfortable and affordable residential apartments in Tbilisi, as well as hotels located in the touristic center of the city. It carefully chooses the locations for potential projects, with the priority of recreation and relaxation with minimal footprint to the urban environment, thus its goal is to maintain the presence in "green areas," far from the city's urban noise and crowded places. Due to professional approaches, rapid and non-compromising quality implementations, the company has acquired its niche on development market and gained the loyalty from its customers. The company team aims high and works hard to create much better, high quality environmentally healthy standards to be shared by other players as well, and establishes new industry standards in the competing field. At the current moment BLOX has four main directions: Residential Apartments (Development and Construction); Hospitality, Hotel Construction and operations; Restaurant Chain: "2 TONS" and Craft Beer production "Boxing Fox." British American Tobacco Group (BAT) is the world's second largest quoted tobacco group by global market share, with brands sold in around 180 markets. BAT was founded in 1902 and by 1912 had become one of the world's top dozen companies by market capitalisation. With more than 200 brands in a portfolio, BAT makes the cigarette chosen by one in eight of the world's one billion adult smokers. Global Drive Brands are Dunhill, Kent, Lucky Strike and Pall Mall. BAT's portfolio also includes Vogue, Viceroy, Rothmans. BAT holds robust market positions in each of our regions and have leadership in more than 50 markets. BAT has sustained a significant global presence for over 100 years. Otokoc Georgia LLC is a 100% subsidiary of Otokoc Automotive Turkey, which is the largest 31st company of Turkey with USD 1.9 billion sales revenues. Otokoc holds the licensee rights of Avis and Budget not only in Turkey, but also represents Avis in Kazakhstan, Azerbaijan, Northern Iraq and Budget in Georgia, Hungary. Otokoc Turkey manages a car fleet of 40,000 cars. Avis Budget Group is a US company with USD 8.5 billion sales revenues operating in 180 countries with 11,000 sales ofices. Founded in late 1998 by Tbilisi State University, Georgian Technical University, Tbilisi State Institute of Economic Relations with partnership of Georgia State University (Atlanta, USA) Caucasus University provides university level education in economics. CU offers undergraduate and graduate degrees in Business Administration, short-term certificate courses and training programs. CleanTech provides professional hygiene systems to hospitality and food companies. Being distributor of Diversey and Kimberly-Clark, the company covers 95% of potential needs of customers in kitchen, hotel rooms, personnel care, laundry linen care, food processing, general and special floor cleaning and maintenance. Company's delivery covers all Georgia, with warehouses in Tbilisi, Batumi and Kutaisi. Coca-cola throught its franchisee Coca-Cola Bottlers Georgia produces world class beverage brands of the Coca-Cola Company, merkets, distributes and sells them in Georgia. Colliers offers comprehensive services to investors, property owners, tenants and developers worldwide. Main directions of the company services are: real estate development service, corporate brokerage, real estate market research, consulting and valuation. Company offers global knowledge and local experience to the Georgian real estate corporate market. Colliers is represented throughout 64 countries including Tbilisi, Georgia. Annual transaction value exceeds 71 milliard US dollars. Central headquarters are located in Seattle, WA, USA. CA International is a third party conformity assessment and inspection body accredited by the LEPL Georgian Accreditation Center (GAC), the official accreditation body of Georgia. Since receiving accreditation in October, 2016 CAI has become a leader in inspection activity in Georgia and scope of services covers oil repositories, oil pipelines, natural gas pipelines, natural gas compressor stations, fueling stations using liquid carbohydrate gasses, liquid oxygen production facilities, commercial nitrogen refrigeration installations, cranes, escalators, amusement parks, pressure vessels, boilers, the Funicular, cable cars and elevators. Cushman & Wakefield Georgia is an established Commercial Real Estate company active throughout Central Asia and the Caucasus with offices in Tbilisi, Astana and Almaty. The firm offers professional advice across a range of services, including Agency (Leasing and Investment), Capital Markets, Consultancy, Valuation & Advisory, Research, Property Management and Serviced & Virtual Office accommodation. Cushman & Wakefield Georgia is the worlds largest privately owned Commercial Real Estate services firm with 16,000 professional staff operating 250 offices in 60 countries. The firm has around $5billion of assets under management with global transactions valued at over $114 billion in 2013. Deloitte began implementation of projects throughout Georgia in 1995 with an official office being established here in 2001. Deloitte Tbilisi is a member firm of Deloitte Touche Tohmatsu. In Georgia the company provides a broad range of services to the clients: audit and accounting, consulting (including IT), financial advisory, tax and legal services, project implementation. The firm’s very talented and qualified staff, with experience in the local market provide international quality work in all these service lines. The company’s goals and strategy are to build the premier professional services firm in Georgia, providing a full range of services to its national and international clients. Local and expatriate professionals work closely together on engagements, as mixed teams ensure the right balance of skills to provide premium client service. Through the projects we undertake in the Georgian market, Deloitte and the Deloitte Overseas Consulting teams has the largest presence of any of the big 4 organizations on the market at any given time. Dentons is the world's largest law firm, delivering quality and value to clients around the globe. Dentons is the leader on the Acritas Global Elite Brand Index, a BTI Client Service 30 Award winner and recognized by prominent business and legal publications for its innovations in client service, including founding Nextlaw Labs and the Nextlaw Global Referral Network. Dentons' polycentric approach and world-class talent challenge the status quo to advance client interests in the communities in which we live and work. Dentons' Tbilisi office opened in 2017 with a team of highly ranked lawyers. With a legacy dating back in 1996, the team is among the most experienced and respected in the Georgian market. Having worked on many of the most important M&A and real estate deals, financing transactions and infrastructure projects, litigation and arbitration matters the company offers you unique insights into the country's legal and business environment. Dentons is a full service law firm in Georgia with key capabilities in Litigation and Dispute Resolution, Corporate, Banking and Finance, Intellectual Property, Energy, Government and Infrastructure. Diplomat Georgia, a fully owned subsidiary of Diplomat Israel, is a company distributing Fast Moving Consumer Goods products in Georgia. The company began operations in July 2008 and has already become one of the largest and most advanced distribution companies in the Georgian market. Diplomat Georgia is the official and exclusive distributor of Procter & Gamble in Georgia. This business relationship provides the company with a strong hold in the marketplace and enables it to provide coverage to an on-going and high quality clientele. Dressler Consulting is a US-based multinational company with offices in the United States, Poland, Ukraine and Georgia. With a highly skilled team of over 100 certified developers and engineers specializing in multiple technologies. Dressler Consulting LLC has designed and developed enterprise business solutions and applications for clients in North America, Western Europe and Eastern Europe. The company provides a full range of services related to software product development and works closely with its clients during the project lifecycle to ensure that the project fully meets all the expectations and requirements. EY’s Tbilisi office is staffed by over 80 professionals, together comprising the largest professional services firm in Georgia. The company serves a distinguished and growing client base that includes foreign and domestic companies and institutions active across all of Georgia's key economic sectors – financial services, oil and gas, energy and utilities, manufacturing, food and beverage, telecommunications, transportation and real estate. EY’s tax professionals provide advice on a wide range of local and international tax matters, including transaction structuring, international tax planning and local tax compliance. In 2011 the company began offering legal services. Through these services, EY can help you retain the confidence of investors, manage your risk, strengthen your controls and achieve your potential. EY is staffed with people with a shared way of working and commitment to quality. This allows the firm to put together a team that can give you the seamless service you need, wherever you are in the world. International freight forwarders, cargo forwarders, charter brokers, air, sea and land customs brokers. Offices are located in Africa, USA, Azerbaijan, Russia, Mongolia, China, Middle East, Europe, Kazakhstan, Uzbekistan, UK, Vietnam. Several other world wide agreements are also in effect. FINCA Georgia - an affiliate of FINCA International Inc., a network of microfinance institutions based in Washington, D.C., with affiliates operating in 21 countries around the world - was established in Georgia in 1998 with support of USAID and the US Department of Agriculture. Since end of 2011, JSC MFO FINCA Georgia is a subsidiary company of FINCA Microfinance Cooperatief U.A., with such shareholders on board, as FINCA International, USA, International Financial Corporation (IFC, World Bank Group)- USA, KfW Bankengruppe, the German development bank, FMO, the Netherlands development bank, responsAbility Global Microfinance Fund, an investment fund advised by the Zurich-based asset manager responsAbility Social Investments AG, and Triple Jump, a Netherlands-based microfinance investment manager. Frontera is a US-based international oil and gas exploration and production company whose shares are traded on London Stock Exchange AIM market. Frontera’s current activities in Georgia are focused on the exploration and development of a large acreage in Kakheti region known as Block 12 where Frontera has the exclusive right to explore for, develop and produce petroleum pursuant to a 25-year Production Sharing Agreement entered into with the Georgian government. With over 190 employees based in the company’s Houston, Tbilisi and Kakheti field offices, Frontera is the largest US-based investor in Georgia’s upstream oil and gas industry. Gazelle Finance Georgia provides growth-oriented risk capital to fast growing SMEs (known as "gazelles" in Georgia). Gazelle Finance Georgia is part of a larger Gazelle Finance investment fund (launched in March 2017, currently capitalized at $28 million but expected to expand) that will invest in SMEs the Eurasia region. Gazelle Finance's high transaction volume, self-liquidating "mezzanine"-like financing product is tailored for fast growing SMEs. The fund makes investments to achieve commercial financial returns, but by focusing on promising SMEs with high growth potential operating in value-add sectors such as agribusiness, manufacturing, and services, the fund also expects to play a role in driving Georgia's economy forward through revenue generation, job creation, export expansion, import substitution, and other means. Gazelle Finance's investors include FMO (Dutch development bank), Dutch Good Growth Fund (DGGF), partnership Fund (Georgia's sovereign wealth fund), and the U.S. Overseas Private Investment Corporation (OPIC). Construction of hydro power plants and high voltage substations. Georgian American Alloys, Inc. (“GAA”), headquartered in Miami, FL, owns and operates a number of companies, both domestic and international, which manufacture and supply various grades of ferrous alloys. Companies under the GAA umbrella include North American-based Felman Production LLC, Felman Trading Inc., CC Metals & Alloys LLC, and Georgia's Georgian Manganese LLC and Vartsikhe 2005 LLC. Georgian Manganese LLC is comprised of Chiatura Manganese Mine and Zestafoni ferroalloys plant that produces silicomanganese. Vartsikhe 2005 operates Vartsikhe hydroelectric plant and powers the Zestafoni palant and Chiatura mine. The company's unique organizational structure allows it to control all facets of the silicomanganese production process. Georgian American University (GAU) is a true Western-style university with schools of Business, Law & Social Sciences, Natural Sciences & Engineering and Humanities & Liberal Arts - providing the best possible academic programs and facilities to meet the needs of the students and the business, governmental and legal communities. GMT Group manages a number of investment projects in hotel business, construction and other areas. Gosselin Mobility Georgia provides international removal services (origin-and / or destination, customs clearance, line haul, storage, insurance, or full relocation) to various diplomatic organizations and private customers. Gosselin Mobility Georgia as a member of The Gosselin Group, is part of a multinational organization with branch offices in 32 countries, more than 600 employees, a million square feet of warehousing and 185 vehicles providing service from the western border of China to The United States. Next to the core business of international moving they also provide transportation, Freight forwarding, customs bonded warehousing & handling and storage solutions. Grant Thornton, the member of Grant Thornton International, is a multi-professional group of public accountants and auditors, advisers in finance, business and management, as well as tax and legal advisers. The company is committed to providing partner-led, personalised services and highprofessional standards dedicated to the needs of public sector and growth-oriented business. Since early 1990s the firm has been providing audit missions, in-depth professional consulting services and specialist advice to governmental organisations, top-level enterprises, national and commercial banks in Georgia, Armenia, Belarus, Russia,Ukraine, Kazakhstan, Uzbekistan, Tajikistan, Mongolia and Kyrgyzstan. Founded by California based Southern Counties Oil Co in 1993, Greco is a pioneer American investor in Georgia and one of the founding members of AMCHAM Georgia. GRECO GROUP through its division companies has diversified investment portfolio in the sectors of Petroleum product distribution, Commercial real estate, and the Transportation. GRECO OIL is an official distributor of ConocoPhillips Lubricants, GRECO TRANS is a distributor of Petroleum products and also involved in Transportation sector through Georgian Truck Center- GTC, and GRECO CENTER is the owner and operator of commercial real estate projects in Georgia. GT Group LTD is a private business, registered in Georgia, which operates on Georgian market since 2005, as a holding company, under the name - GT Group LTD.
GT Group officially represents number of international brands in Georgia: Ford, New Holland Agriculture, New Holland Construction, BP Castrol, KUHN Farm Machinery, Gregoire Besson, Agromaster, Curtis Dyna Fog, HAKO GmbH, TOPTUL, NORMFEST and TANA Oy. Gulf Georgia is one of the leading oil companies on the Georgian market. Its success is driven by high quality fuel and customer service. This international brand has been represented officially in Georgia by "Sun Petroleum Georgia" LLC, since November 2010. The company traces the establishment of our world brand to 1901 in the USA. Nowadays Gulf Oil International distributes high quality oil products to more than 100 countries and is one of the major players in the world market. Gulf Georgia currently successfully operates 140 refueling stations nation-wide. Since 2012 the company introduced the branded convenience stores and several CNG stations. In 2013 Gulf Georgia introduced the first in Georgia self-service fuel station. Gulf is one of the major employers in Georgia – currently has more than 1300 employees and their number is growing. The company imports fuel from the best oil refineries in Europe whose quality control complies with world class standards. Gulf refueling stations are distinguished with modern equipment and western state-of-the-art innovative technologies. Hilton Batumi, an international 5 stars property in Batumi opens in September 2014. As a part of the Hilton brand the hotel seeks to play a leadership role in hospitality industry, providing outstanding quality of service, offering supreme accommodation and guest experience as well as meeting and conference services. JSC Iberia Refreshments was formed in 2004 after reorganization of the Iberia Refreshments Ltd. The latter was founded in 2001. The company is engaged in carbonated soft drinks business. IMSS Ltd. Georgia is a leader in 24/7 quality health care provision and emergency readiness response. IMSS medical staff consists of expatriate and internationally qualified (US& European trained) Georgian physicians, who regularly undergo training in leading UK hospitals and other international medical centers. Doctors are fluent in Georgian, English, Russian and German. In 2010, Kavkaz Cement established the company Kavkaz Cement Georgia (KC Georgia) and began production of concrete and raw materials in Poti and Natanebi, Western Georgia. Later KC Georgia put into operation a new stationary batching plant in Tbilisi. Nowadays the company offers a variety of high quality ready-mixed concrete and provides full service with mixer trucks and mobile pumps. JSC m² Real Estate was established by JSC Bank of Georgia in 2006. Driven by a team of highly qualified professionals, JSC m² Real Estate is a significant player in the real estate market in Georgia. Key business directions: real estate development and property management. At various times, shareholders of m² Real Estate were the emerging markets investment funds with a combined investment of more than $10 million in JSC m² Real Estate. At present, JSC m² Real Estate is a wholly owned subsidiary of investing company "Georgia Capital". Member of, and owned by, the A.P. Moller group, engaged in shipping, exploration for and production of oil and gas, ship building, aviation, industry, super markets and EDP services. Maersk Georgia LLC is an agent for Maersk Line, the world's leading International container carrier. Mars makes many great products: chocolate, quality pet foods, nutritious family foods as well as tasty gum and confections. Mars operates more than 400 factories and offices in 80+ countries. The company has more than 100,000 associates, thousands of suplliers and millions of consumers worldwide. Mars is the company behind many of the enduring brands Georgian citizens have come to know and trust. These brands are confectionery - Skickers®, M&Ms®, Twix®, Mars®, Bounty®, Milky Way®, Orbit®, Skittles®; pet nutrition - Whiskas®, Kitekat®, Catsan®, Pedigree®, Chappi®. Tbilisi Marriott Hotel, opened in September 2002, is the first hotel of the International Marriott Hotel Chain in the Caucasus. It offers 127 rooms and suites (8 Junior Suites, 2 Presidential Suites, 1 vice-Presidential Suite), a fully equipped Health Club, Business Center, Restaurants and Lounges (Majestic Restaurant and Outdoor Patio with International cuisine, Café Parnas, The Wine Bar with International cuisine, Lobby Lounge and Private Dining Room). Also available are seven international standard meeting/conference rooms, of which the Ballroom with the largest capacity. The Courtyard by Marriott Tbilisi also managed by Marriott International is planned to be put into operation during 2003. Mastercard Incorporated is an American multinational financial services corporation headquartered in the MasterCard International Global Headquarters in Purchase, New York, United States. The Global Operations Headquarters is located in O'Fallon, Missouri, United States, a suburb of St. Louis, Missouri. Throughout the world, its principal business is to process payments between the banks of merchants and the card issuing banks or credit unions of the purchasers who use the "Mastercard" brand debit and credit cards to make purchases. Mastercard Worldwide has been a publicly traded company since 2006. Prior to its initial public offering, MasterCard Worldwide was a cooperative owned by the more than 25,000 financial institutions that issue its branded cards. In Georgia, UPS business is represented by Meridian Express LTD as an Authorized Service Contractor of UPS and provides high quality express international and domestic shipping and logistic services to customers. Meridian Express Ltd. has always been providing UPS services in Georgia in compliance with UPS standards and quality and has always been concentrated and focused on customers’ individual needs, demands and problem solutions. As Meridian Express Ltd. Team states, they are glad and proud of not having any single court or arbitration disputes with customers since 1996. All the services and business provided by the company is always compliance with Georgian and international LAW and oriented developing their business as much higher quality as possible to promote , support and allow its customers business to better serve their own customers and focus on their core competencies, which in general is positively impacted on the economy of Georgia. Founded in 1975, Microsoft (Nasdaq “MSFT”) is the worldwide leader in software, services and solutions that help people and businesses realize their full potential. Microsoft Georgia operates in the country since 2009 with the goal of promoting it is licensed offerings to corporate customers and consumers. Office Technologies is the leading specialist in office design, project management and office furniture supply in Georgia. Using in-depth knowledge of work and work processes, team of Office Technologies makes a meaningful and measurable contribution to the success of its customers. Founded in 2005 it has continuously developed and diversified the range of services becoming a reliable partner of many international and local companies. The company is the authorized dealer of Steelcase in Georgia, American company and largest office furniture manufacturer in the world. As a work effectiveness company, our mission is to help organizations work more effectively by improving the quality of their work environment. Turning ordinary office into effective office space, creating atmosphere of comfort and convenience, we take care that office becomes inspiring where people can do their work effectively and with pleasure. Oracle Nederland B.V. does business in Georgia and works with financial institutions, utilities, transportation, public sector, telco, entertainment, retail and other industries providing information technologies, cloud services, hardware and maintenance services. Orient Logic offers wide range of enterprise servers and server solutions from world leading manufacturers such as DELL, HP and SUN. View specifications and choose the correct server configuration based on your application and server environment using convenient tools & links. Pace International LLC was established in New York, USA in 1997. Pace International LLC is a founder member of Pace Group. Pace Group involves several companies engaged in international freight forwarding, transportation, berth operations and other transport related activities. From 2015, Pace Group started development of an ultra-modern port terminal complex on 25 hectares of land in Poti. The total cost of the project is 120 million USD, with the first stage of investments being 93 million USD, of which 50 million will be financed by OPIC. New terminal will allow us to receive vessels with the capacity of 50,000 tons and significantly increase cargo turnover. Wimm-Bill-Dann Georgia produces dairy products under brand names “Soplis Nobati”, “Domik v Derevne” and “Chudo”. Philip Morris Georgia LLC is an affiliate of Philip Morris International Inc. (PMI) - the leading international tobacco company, with seven of the world’s top 15 international brands, including the number one cigarette brand worldwide. PMI’s products are sold in more than 180 markets. In 2014, the company held an estimated 15.6% share of the total international cigarette market outside of the U.S., or 28.6% excluding the People's Republic of China and the U.S.
ProCredit Bank is one of the leading financial institutions in Georgia focused on lending to very small, small and medium-sized enterprises and offers legal entities and individuals full range of banking services. The bank started operating in Georgia in 1999. It is a part of an internationally operating banking group that covers 22 banks on three continents of the world. With more than 1,500 employees in 46 branches all across Georgia, ProCredit Bank offers excellent customer service and a wide range of credit products. The stability and reliability of the Bank is reflected by Fitch assigning ProCredit Bank with Georgia's best and highest possible rating "BB-". ProCredit Bank shareholders are ProCredit Holding AG, Frankfurt, Germany and Internationale Projekt Consult (IPC) GmbH, Frankfurt, Germany. Two members of Management Board are ProCredit Bank’s representatives at AmCham. Radisson BLU Hotel is located at the Rose Revolution Square on Rustaveli avenue, it is in the heart of Tbilisi. Hotel offers magnificent view of the city and the river. 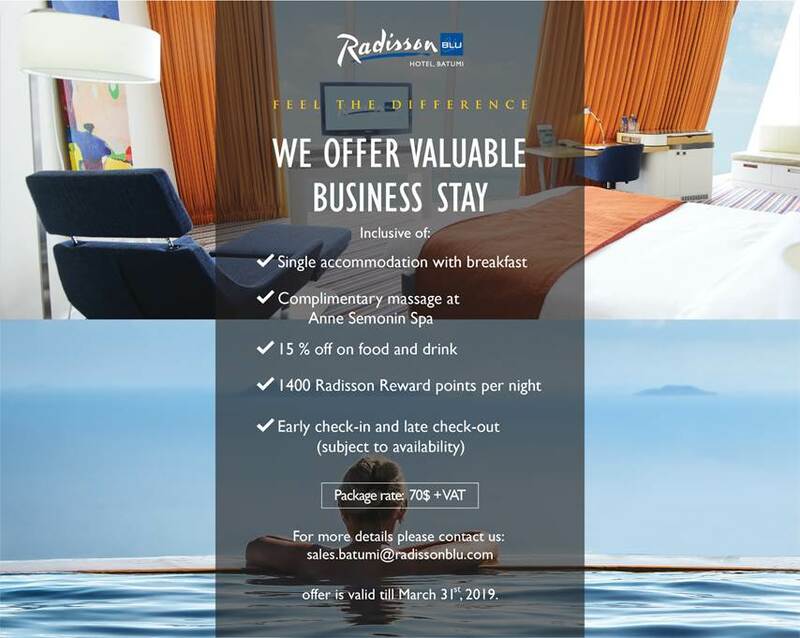 Radisson SAS Iveria Hotel offers the highest quality of service and hospitality. 249 Rooms (All rooms come with high-quality amenities from Anne Simonin; rooms including 62 connecting rooms and ten rooms for disabled guests), 862 sq. meter meeting business center with 10 meeting rooms and elegant 346sqm Iveria Ballroom, 1600sq meter Anne Simonin SPA, Italian terrace restaurant, international restaurant, bar on top floor and Lounge bar is designed to exceed your expectations. School of Tomorrow was founded in 1992 as the first private school in Georgia. It offers the approved Georgian curriculum in addition to the American based program. recently the American program was accredited by "Accreditation International", an orgazation based in the U.S. American program is based on Dr. R. Howards curriculum aims to identify and develop the intellectual abilities of children. The School of Tomorrow has had graduates since 1999. Sheraton Metechi Palace Hotel - the first 5-star international hotel in the entire Caucasus region since 1997, located in the heart of the historic center of Tbilisi. The hotel is managed by Marriott International, one of the world's leading hotel management companies. The Sheraton Metechi Palace, Tbilisi's iconic five star hotel, is to be dramatically transformed by a major investment, which will allow the hotel to be restored to its full glory. To facilitate the $50 million refurbishment program to take place, the hotel is closed and we will be delighted to host you at the city's signature hotel after re-opening. The landmark hotel, which was opened in 1997, will be upgraded with state-of-the-art fitness and spa facilities, as well as new restaurants, bars and an exclusive club lounge. The hotel's conference and events center will be further expanded and will offer the biggest Ballroom in the city, 1000sqm; Hotel features include 12 meeting rooms; Meetings & Events area is 2600 sqm. This can accommodate up to 2000 people: from small to big conferences, meetings, exhibitions, private diners or Gala events with its facilities being upgraded with the latest amenities and the signature services of the Sheraton brand. The hotel's guest rooms will be completely re-designed so that post-renovation; the hotel will feature a total of 220 luxurious guest rooms, club rooms and suites. The company is organized around three global businesses: security inks; government security solutions; product and brand protection solutions. The executive management team of SICPA, together with several group functions, are based in the Lausanne Headquarters. Spotcoin is a Crypto-currency trading platform that is managed from Georgia. The company started operations in December of 2016 and just received investment to increase operations in Georgia and globally. T&K Restaurants was registered in December 1997 as a joint venture between McDonald's Corporation and local partners Temur Chkonia (Presidnet of Coca-Cola Bottlers Georgia) and Tengiz Kapanadze (Managing Director of T&K Restaurants). Total investment in this business is approximately 3 million US dollars. Registered in 1992 TBC Group is the holding company for GGMW (Georgian Glass and Mineral Water) and TBC Bank - Banking and Financial Services. TMC is a leading logistics and global professional services provider in Central Asia, the Caucuses and surrounding regions that provides effective solutions to help government, non-government and commercial clients meet their most challenging needs in the global markets. With offices in Russia, Ukraine, Georgia, Azerbaijan, Kazakhstan, Uzbekistan, Tajikistan, Kyrgyzstan, Afghanistan and Romania, TMC is uniquely positioned to solve your most challenging needs in these regions. TMC has successfully operated in 70+ countries and continues to expand its global footprint. Visa International Service Association is a global payments technology company that connects consumers, businesses, financial institutions, and governments in more than 200 countries and territories to fast, secure and reliable electronic payments. Visa operates one of the world's most advanced processing networks - VisaNet - that is capable of handling more than 65,000 transaction messages a second, with fraud protection for consumers and assured payment for merchants. Visa is not a bank and does not issue cards, extend credit or set rates and fees for consumers. Visa�s innovations, however, enable its financial institution customers to offer consumers more choices: pay now with debit, pay ahead with prepaid or pay later with credit products. West Invest Ltd. is the largest distribution company of frozen products in Georgia. Company has several own brands: Bibilo, Mamalo, West Fish, West Pork and also is exclusive distributor of foreign brands Divnoe, Qualiko and Ukrainian Chicken. It is exclusive partner in Georgian of Simmons Farms (US) and Mironovski Hleboproduct (Ukraine). Willis Towers Watson in Georgia provides a broad range of risk advice and insurance broking services to clients ranging from small businesses to international corporations. Services include: risk management, creating insurance products on the basis of complex analysis, getting the terms and prices from insurance companies, analyzing offers and choosing the best option working on reinsurance, offering international health insurance, providing services after insurance. Willis Towers Watson is a leading global advisory, broking and solutions company that helps clients around the world turn risk into a path of growth. Adjara Group Hospitality is the largest and the most rapidly-growing holding company in the hospitality sector of Georgia in both quantitative and qualitative terms. From the very beginning, the company team aimed to set industry leading standards through accelerated growth, employee motivation, and dynamic development. Adjara Group Hospitality currently owns and manages 3 hotels and one hostel in Georgia: Holiday Inn Tbilisi, Rooms Hotel Tbilisi, Rooms Hotel Kazbegi and Fabrika Hostel & Suites providing over 1000 jobs in total. In the end of 2016 Adjara Group Hospitality also opened Aviator - the first Georgian Airline company offering Air Taxi services, flying both, domestic and international routes. AE Solar is one of the leading brands in renewables, providing high-quality photovoltaic energy products, services and energy storage solutions since 2003. AE Solar Smart Technology was awarded as "Top Innovation 2018" by PV Magazine and SNEC 2017 "Top 10 Highlights". In Georgia AE Solar established companies for global sales, EPC services for PV projects and manufacturing of PV modules. Air Astana commenced regular flight operations on 15 May 2002 and currently operates a network of over 60 international and domestic routes from hubs in Almaty, Astana and Atyrau. Air Astana operates an all-western fleet of Boeing 767, Boeing 757, Airbus A319, A320, A321, A320neo and Embraer E-190. Air Astana became the first carrier from the Commonwealth of Independent States (CIS) and Eastern Europe to be awarded the prestigious 4-Star rating by Skytrax in its World Airline Awards 2012 and was named The Best Airline in Central Asia and India for five consecutive years. APM Terminals Poti is a part of A.P. Moller-Maersk, the world's largest integrator of container and port logistics, with over 70 terminals in 59 countries. APM Terminals Poti Sea Port is the port services and container solution provider of choice for Georgia and the Caucasus and handles over 80% of container volume in Georgia. The port works with shipping lines, importers/exporters, governments, business leaders and the entire global supply chain to provide solutions that help nations achieve their ambitions and businesses reach their performance goals. Aversi is the leading healthcare provider in Georgia. Its mission is to be the most valued and trusted healthcare organization for its customers, patients, partners and colleagues. The company's core values are based on trust, honesty, integrity, quality and caring for the well-being of the patients and customers. Currently Aversi is involved in pharmaceutical wholesale/retail business, pharmaceutical production, hospital management and insurance businesses. The company holds GMP/FDA standards for its pharmaceutical manufacturing plant and ISO: 9001 for Aversi Clinic. Aversi's business philosophy is to provide the society with high quality, affordable healthcare products/services and sustain a leadership position through continuous development. Baker Tilly International, represented by its independent member Baker Tilly Georgia, is 8Th largest worldwide network of independent accountancy and business advisory firms united by a commitment to provide exceptional client service. Each member of Baker Tilly International has expertise and experience, which benefits fellow members of the network. Working together, exchanging ideas and discussing approaches to new challenges are an invaluable part of our activities. Bank of Georgia is a leading Georgian universal bank, providing a full range of commercial and investment banking, wealth management, insurance, trade finance, leasing and card processing services to its corporate and retail clients. The largest retail bank in the country with an 36% market share by total assets, Bank of Georgia serves 739,522 retail clients through its network of 142 branches and 405 ATMs (the largest ATM footprint in Georgia), as well as through other delivery channels including the Internet, mobile banking and state-of-the-art call center. The bank, together with its wholly-owned subsidiaries, is organized into the following Strategic Business Units ("SBU"s) - Retail Banking (RB), Corporate Banking (CB), Insurance and Corporate Center (CC) and Business Units ("BU"s) - Wealth Management (WM) and BG Capital. On 29 November 2006, Bank of Georgia became the first company from Georgia and the second bank from the CIS to list its shares in the form of GDRs on the London Stock Exchange (LSE: BGEO). A benchmark stock on the Georgian Stock Exchange (GSE: GEB), Bank of Georgia has been listed on the GSE since 2001. As of 30 September 2010, the bank was approximately 93% institutionally owned, with the remainder owned by senior management and approximately resident and non-resident retail shareholders. Bank of Georgia remains to be the only Georgian entity to be rated by all three global rating agencies: 'B/B' from Standard & Poor's, 'B1/NP' (FC) & 'Ba3/NP' (LC) from Moody's and 'B+/B' from Fitch Ratings. In March 2008, 2009 and 2010 Bank of Georgia received Best Bank In Georgia 2008, Best Bank in Georgia 2009 and Best Bank in Georgia 2010 Award from Global Finance Magazine. In July 2005, 2006, 2007, 2008, 2009 and 2010 Euromoney, a leading capital markets publication, named Bank of Georgia the winner of the Best Bank in Georgia Award for Excellence. In December 2006, 2007, 2008 and 2009 Bank of Georgia received The Bank of The Year Award for Georgia from The Banker, the publication of Financial Times Business Ltd, a member of the Financial Times group of companies. JSC BasisBank is a local commercial bank proving a full package of banking services to its customers. The main focus of the bank is to acquire strong recognition and support among its overseas partners to promote and assist its customer business interests locally and internationally. Batumi International Container Terminal LLC (BICT) is the first and only maritime container terminal in Georgia where vessel handling and storage of containers are within the port area. From November 2007 the Container Terminal (berth 4/5), Ferry Bridge and General Cargo (berth 6) at the batumi Seaport have been operated by BICT. BICT is a subsidiary of International Container Terminals Services, Inc., a Philippine based company, widely recognized as a leading terminal operator. Batumi International Container Terminal LLC officially started its containerized cargo handling service on 2nd March 2008, with the arrival and service of M/V MSC GRANADA, the first ever container ship to dock in Adjara, Georgia. Over the years the company has handled various types of cargo, including non-containerized cargo and provide a wide range of services for vessel loading and discharge, cargo storage, container stripping/stuffing, receiving and delivery of cargo from trucks or rail wagons. Since 1999 BDO is one of Georgia's largest accountancy firms, currently 4th in national ranking. With the offices in Tbilisi and Batumi BDO provides services to a diverse range of clients, from large corporate organizations to private businesses, public sector and individuals across a broad array of industry sectors. Being one BDO (with more than 100 professionals) is a challenge BDO Georgia shares with all member firms worldwide (154 countries), a challenge solidly relying on unique BDO experience, values and relationships. BGI Advisory Services Georgia Ltd.
BGI Legal is part of BGI Advisory Services Georgia, an international advisory services group based in Georgia. BGI is a successor of GCG Law Office (member of the Andersen Legal network at the time) and shares the legacy of EY Law Tbilisi. Currently, BGI is Georgia's leading full service law firm, offering its clients full scale of legal and professional services. Our practice offers unparalleled diversity and breadth in its ability to guide clients in the increasingly sophisticated environment of Georgia’s fast-paced economic and legal development. The Biltmore Hotel is ideally situated within the historic and cultural district of Tbilisi. Close to the east bank of Mtkvari River, this hotel is suitable for both business and leisure travellers. The grand lobby echoes the nostalgia of a bygone era, with an immaculately restored grand lobby that resonates the glamour and prestige of the social elite and transports guests into an envelope of luxury, unseen or experienced by others before. 214 luxury rooms and suites provide free high-speed wireless Internet, upscale bathroom amenities and beautiful views of the city. With distinct lifestyle and dining venues and a one-of-its-kind entertainment arena, this property is the only address for glamorous lifestyles. An urban retreat for the privileged few or the ideal partner for those conducting business in the city, The Biltmore Hotel Tbilisi is the ultimate address for discerning travellers. BLC Law Office is one of the largest law firms in Georgia, which is composed of western educated attorneys and tax advisors. BLC Law Office provides full scale professional legal services to foreign and domestic companies. BLC Law Office is engaged in the network of the law firms in CIS countries, which increases efficiency, quality and accessibility of legal services to our clients and provides an important venue for success of clients’ business. BLC’s Partners: Alexander Bolkvadze (LLM), Ketti Kvartskhava (LLM), Levan Dadiani (LLM). Gorgia was founded in 1998 and has become one of the first DIY retailer on Georgian market specialized on building and construction materials distribution and retail sales. Today Gorgia is the largest home improvement specialty retailer group in Caucasus region. By strong distribution chain Gorgia sales its imported building materials in Georgia, Armenia, Azerbaijan, Ukraine and Kazakhstan and has its own production of pipes. The distribution network includes about 1500 shops in Georgia. Corporate sales provide about 1000 building units. In Georgian retail market Gorgia is presented by two brands: Hypermarket Gorgia and Gorgia Premium. Gorgia is present with branded shops in biggest cities of the country: Tbilisi, Kutaisi, Batumi. Borjomi Likani Hotel resides in the beautiful pre-alpine area, carrying the name of the well-known mineral waters of Georgia. The hotel is located only 90 minutes drive from the capital Tbilisi airport. The hotel has 151 deluxe rooms and design suites, with stupendous view to the surroundings. There are two restaurants, bar, 3 well-appointed spacious meeting rooms, the hotel can cater for up to 500 corporate guests or for weddings. State of the art Audio-Video systems are available. Spa Centre offers unique purification and revitalization programs combined with traditional Turkish Hammam, 3 Sauna rooms, swimming pool, jacuzzi, solarium and 8 well appointed massage rooms for various therapies. The Wellness & Health Center also offers a wide variety of services, based on the healing capabilities of Borjomi Waters. Kids Club, located outdoors, in the vicinity of the Hotel, takes care of the small VIP on daily basis offering hourly activities and kids care. As for the adult entertainment, Borjomi Likani makes its best to make your stay as fun as possible. The indoor activities of the hotel include table tennis, billiard room, weekend Karaoke nights, live music and different theme events spread throughout the year. But the most interesting part starts outside the building. The 43 hectare territory of Borjomi Likani provides the opportunity for numerous outdoor activities. The guests can try themselves in the archery, shooting, volleyball or basketball. ATV tours are available in the depth of the park, giving you the chance to ride to the place that you might miss to visit otherwise. What is a better way to spend your day other that ride a horse or a bicycle? For those fond of more extreme sports the rafting is available, under professional supervision by all means. A 10 km river track ends just in front of the hotel building. Hiking tours are just another way to spend time in Borjomi Likani. The Petre Fortress is located 2-3 km up the mountain. The guided tour lasts for about 2 hours, giving you the chance to enjoy wonderful views and make photos. All of the above mentioned are just a part of the activities one can undertake in Borjomi Likani and the choice is yet to become richer, as it is the hotel's main goal to develop farther. Caucasus Online is the largest ISP business company in Georgia. It was created as a result of merger of the three largest ISPs in Georgia. The company keeps the leading position on the market. CaucasTransExpress started operating as an international freight forwarder in Tbilisi, Georgia in 1999. In this short time lag, everyone worked hard to achieve the goal of making company capable of providing a full and comprehensive range of services. Nowadays the company is represented all mode of land, sea and air transport. CaucasTransExpress covers Caucasus the Central Asia and main ports of Black sea, including Poti, Batumi, Chornomorsk (Illichivsk), Odessa and Istanbul. With representative offices and business tie-ups with partners throughout the world, the company can truly guarantee that CTE provides services on a global scale. Channel Energy was set up in 1999 to offer a fresh approach to the business of energy storage in the Caucasus that had been part of the region’s history since the mid 1800’s. The Terminal has been part of the enlargement project of the Poti Sea Port and provides an important storage and throughput services to importers and exporters of petroleum products and an alternative to the other Georgian Terminals located at Batumi and Kulevi. The company has, and continues to create and deliver new international standard facilities and services in the Georgian ports of Poti and Batumi. With invaluable expertise and support from EBRD, Channel Energy’s developments have been planned and delivered with the environment at the forefront. Château Mukhrani is based on the ancient tradition of wine-making in Mukhrani region. This is the first and the only true Georgian Royal Chateau, which unites four key components: vineyards, winery, castle and history. Château Mukhrani winery is equipped with ultra-modern technology and corresponds with ISO 9001:2005 Food Safety and ISO 9001:2008 Quality Management standards. Since 2007, Château Mukhrani is making wine from grapes harvested in its own vineyards. Château Mukhrani wines received numerous awards on local and international competitions. City & Co does real estate projects, mainly trading of offices and apartments and construction of residential buildings. Beside of these the company aims to build an serviced apartments building for medium to long term visitors to Georgia and plan to provide special offers to AmCham members. Construction Management & Consulting (CMC) is a Limited Liability Company founded in 2009. As the company grew, it has been engaged in the process of constructing of the most modern and quite complicated projects from the architectural and engineering point of view. Since its inception, the company has carefully built its reputation as a proven and reliable regional solution for construction management and consulting, known for its ability to deliver high quality projects on time and on budget. CMC covers a broad range of sectors, including civil (governmental) projects, commercial, residential, industrial, retail, hospitality and mixed-use, including following services: construction management; construction planning services; program and project management; project risk management; CPM Scheduling; cost estimating; value engineering; tendering; budgeting; design reviews; change order management etc. CMC has built international networks of service providers, vendors and distributors, so that the local projects can be completed to the highest standards on time. Crowne Plaza Borjomi is situated in the heart of Borjomi, a picturesque Georgian spa and resort town, nearby Borjomi Park. The hotel features 101 well-appointed guest rooms and suites. Complimentary Wi-Fi and specialty pillows are on offer. Modern guest rooms, terrace café, two restaurants, bar and Wine bar, Club Lounge and the gym, exclusive Wellness & Spa Centre (2.400 sqm), and leisure facilities like: Swimming Pool, Jacuzzi, Saunas, different relaxing areas and health treatments. Hotel has two floor playroom and dedicated kids’ menu for the youngest guests and 6 meeting rooms with 500 m² space for up to 500 guests. The hotel will be open in the beginning of August. JSC MFO Crystal is a dynamically growing microfinance organisation supporting micro and small businesses in Georgia with objective of poverty reduction and sustainable economic development. Through the expanding network of offices, Crystal offers a wide range of financial services to low-income and economically viable entrepreneurs. Committed to good corporate governance, Crystal aims to keep the balance between social objectives and uncompromised financial performance. Dio represents a highly qualified professional team that is oriented towards the constant improvement of the quality of its products and customization. The company has a wide range of its manufactured products: PVC doors and windows, Pergola, glasing systems, blinds, mosquito screens, awning, external shading systems, umbrellas, glass enclosed blinds, barissol, windows shutters, infrared heaters, mist cooling systems, garage doors, sun sail, membranes, industrial doors, door automation. Dio has own representatives in various regions of Georgia: Batumi, Telavi, Kutaisi, Khashuri and Gori. Domsons' Engineering is a leading Georgian group specializing in MEP Engineering on different levels. Group consists of three companies (Daikin Georgia LLC, Gradus LLC, Techknowledge LLC), each of them using its knowledge to ensure customer satisfaction on every level of provided service (HVAC, water & sewage, elevator, firefighting, electricity, low voltage, BMS). Dorche Prefabricated Building & Construction Industry Trade INC., founded in 1982, is a Turkish General Contractor, with a vast worldwide experience, which provides Engineering, Procurement and Construction services for projects requiring high quality services in extreme environments. Dorche stands out with its ability to quickly mobilize & operate in the harshest conditions in several countries at the same time. Dorche owns one of the largest prefabricated steel structure manufacturing facilities in the world. The manufacturing facility located in Ankara - Turkey. Duty Free Georgia (DFG) is young, ambitious and progressive team of professionals. DFG operates a retail management model that is innovative, flexible, dynamic and centered on all customers. Currently the company has 5 border shops on four Georgian borders: Red bridge – zerbaijan border (two shops), Sadakhlo - Armenian border (one shop), Sarpi – Turkish border (one shop), Vale – Turkish border (one shop). Duty Free Georgia aims to provide customer satisfaction and their happiness by supplying the widest product range with the most reasonable prices and high quality sales service. The company is open for any new future investments on the territory of Georgia and outside of this country. Production of alcohol (beer) and non-alcohol (CSD) beverages. Expo Georgia is the only convention center in Georgia and the leading one in the Caucasus region. The company organizes trade fairs and various types of conferences, congresses and events.History of the Convention Center starts in 1958. At that time, State has built temporary exhibition pavilions and organized industrial exhibition to celebrate 1500 years anniversary of Tbilisi. Large-scale construction works began in 1961 and as a result 11 pavilions, green house, pools and park were placed in the city center. During the Soviet Period exhibition center was a place for permanent exhibition of industrial and agricultural achievements of the Soviet Republic. Once a year the space was devoted to international exhibitions. In 1994-1998 organization was privatized and transformed into a joint stock company. Infrastructure was modernized. Expo Georgia has been assigned a very important role – guiding foreign capital inflow in Georgia and opening international markets for new Georgian businesses. Over the years, events hosted by Expo Georgia have become an excellent forum for decision makers to evaluate new products, make new contacts, enhance supplier relationships and conduct purchasing activities. Many local and international companies view Expo Georgia as a reliable partner and key liaison for the establishment and development of business relations. Throughout the world Gebrüder Weiss can be found in 28 different countries with 162 locations and about 6000 emplyees. The company is regionally focused on Europe, Eastern Europe, Asia and the USA. Gebrüder Weiss's glogal network is complemented by numerous strategic paertnerships and solidarity companies, which allow Gebrüder Weiss to offer its customers the entire services range of the transport and logistics sector. Gebrüder Weiss Georgia offers land transport, air and sea fright as well as logistics solutions. The first GSM operator in Georgia, Geocell has been operating since March 1997. It now offers almost 80% coverage for Georgia and roaming in 87 countries through 200 operators. Established in 1997, GeoEngineering operates in Georgia and Azerbaijan. Services of GeoEngineering include engineering surveys, design, construction, project management, etc. GeoEngineering operates in the following areas: transport systems, energy and civil engineering. Over 95% sales account for international clients such as BP, Chevron, Conoco, Siemens, Spie-CAPAG/Petrofac, GPC, U.S. Embassy, AIOC. Geomill LLC is a vertically integrated structure embracing companies specializing in production, processing and storage of agricultural products as well as food manufacturing and distribution. Geomill LLC is one of the leaders of wheat milling industry of Georgia. GEOMILL LLC includes the enterprises incorporated by an overall aim to build the modern agrarian and industrial structure who's main target is to manufacture of non-polluting food stuffs from domestic raw materials using the advanced technologies. Air company “Airzena” was established in September 1994. In october 2004 company was renamed to “Georgian Airways.” Company started its business with operating charter flights. Since 1997 company started operating the regular flights to Vienna, Dubai and Tashkent. For that concluded business relationships for Interline and Code-share Agreements with “Austrian Airlines” and “Uzbekistan Airways.” It gave “Airzena” the chance to carry Georgian passengers to a huge number of destinations in Europe, Asia and America. In November 1999 two Georgian air companies “Airzena” and “Air Georgia” merged. “AIRZENA Georgian Airlines” was founded as a result of this merging. This company became the biggest and the strongest in Georgia. The team which is experienced in the production of Georgian beer and non-alcoholic fresheners started new production of beer and non-alcoholic beverages with unique water in the entrance of village Saguramo, at the foot of Zedazeni mountain-a new era of beer started at the Georgian market. Within record period of 7 months an unprecedented factory was designed and built, which is exemplary for famous German and Czech breweries. A mission of the company is to combine the highest standards of beer and carbonated soft drinks production with the best Georgian water in order to obtain mass product that Georgia will be proud of. International express deliveries; global freight forwarding by air, sea, road and rail; warehousing solutions from packaging, to repairs, to storage; mail deliveries worldwide; and other customized logistic services – with everything DHL does, the company helps connect people and improve their lives. With a global network in over 220 countries and territories across the globe, DHL is the most international company in the world and can offer solutions for an almost infinite number of logistics needs. DHL is part of the world’s leading postal and logistics company Deutsche Post DHL Group, and encompasses the business units DHL Express, DHL Parcel, DHL eCommerce, DHL Global Forwarding, DHL Freight and DHL Supply Chain. Georgian Hospitality Group is a holding, which owns leading Georgian tourism and hospitality serviced providers such as: Caucasus Travel, Georgian Events, Explore Georgia and & CT Auto. Each of them have reached leading positions in their fields, gained reputation of high professional, reliable partner as on international market, as well as locally. - Caucasus Travel - established in 1991 is incoming tour operator and destination management company specialized in cultural and adventorous tours for groups and independent travellers to South Caucasus countries. - Georgian Events - are marked leaders in conference organization/management, all kind of events and equipment rental. - CT Auto - provides self-drive car rental and chauffeur diver services, aslso offers short and long term rentals, intercity transfers in Georgia and South Caucasus. Georgian Hospitality Group aims to develop Pprojects and attract investments in tourism and hospitality infrastructures. Georgian Industrial Group is the largest industrial holding in Georgia with a diversified business portfolio, including coal mining, energy generation (hydro, natural gas and coal fired power plants), natural gas sales and real estate. With 20 years of business experience in Georgia, the group adopted a holding company structure in 2006. In 2015 company had revenue of more than 160 million USD and employees of more than 3,000. GiS is a solutions provider in the field of audio-visual systems and in other related technologies, based in Tbilisi, Georgia, having partners regionally and internationally. GiS represents world leading brands as: DIS, Bose®, Cisco, Shure, Crestron, Avaya, ElementOne, NEC, Dzine, Barco, Projecta, Optoma, KINDERMANN, QOMO, Chief, Audipack, ClearOne, Extron, Fog Screen, Locatel, U-Touch, Lava, Wolfvision, Polyvision, Listen Technology, Kramer, etc. Today GiS Offers: Videoconferencing & Telepresence Systems, Unified Communication Solutions, Digital Conference Simultaneous Translation & Congress Systems, Parliamentary and Interactive Voting Systems, Wireless Microphones for Corporate and Music Events, Professional Displays & Video Walls, Projection Solutions & Interactive Boards, Professional & Industrial Audio Systems, Smart House Systems & Home Automation, Hotel Television & Hospitality Applications, Digital Signage & Room Booking Systems, Outdoor Visualization & Public Displays, Customized Solutions.Mounting solutions & other accessories. Geo Steel LLC is one of the largest direct foreign industrial investments in Georgia. It is a joint venture of JSW Steel Netherlands BV (wholly owned by JSW, India) and Georgian Steel Group Holding Ltd (GSGHL). JSW is a trusted name in the Global steel manufacturing having interests in mining, energy, cement, infrastructure, building-systems and logistics. Geo Steel has enhanced the ability of customers by sourcing reinforcement bars locally, thus increasing their efficiency. Furthermore, it has taken an initiative to rejuvenate Georgia`s metallurgical industry and boost its economy by using its local scrap metal for the production of construction materials. The company aspires to be the industry leader in whole Caucasian region. The state of the art technology in the form of completely automated oxygen plant, electric arc furnace, ladle refining facilities, continuous caster machine, modern laboratory facilities, and precision control rolling mill has enabled the company to provide construction materials for many important projects such as the Parliament of Georgia in Kutaisi. Globalink Logistics LLC is an international freight forwarding, project logistics & relocation service provider that manages the movement of cargo via sea, land & air on a global scale. The company is a full service logistics provider. Globalink is the only logistics provider in Georgia and the CIS market offering a complete set of logistics solutions to its customers. Companys "one stop solution" concept has been developed to enable customers to direct all their requirements, be it Multimodal Freight Management, Warehousing, Customs & Distribution, Project Logistics, Removals & Relocation and other value added services to a single source rather than using multiple ones. With the entire organization dedicated to providing cost effective alternatives to the customers & associates, Globalink is the forwarder of choice and The Partner you can depend upon. Gloria LLC is a growing company in hospitality sector. Gloria LLC successfully operates - A luxury boutique hotel "Tiflis Palace" and one of the most popular and beautiful restaurant "Tiflis Veranda" in the very heart of old Tbilisi for more than 5 years; and a newly opened 5 star hotel "The Grand Gloria" in Batumi. Tiflis Palace is a luxury boutique hotel that offers the opportunity to enjoy the unique combination of facilities and advantages in Tbilisi. 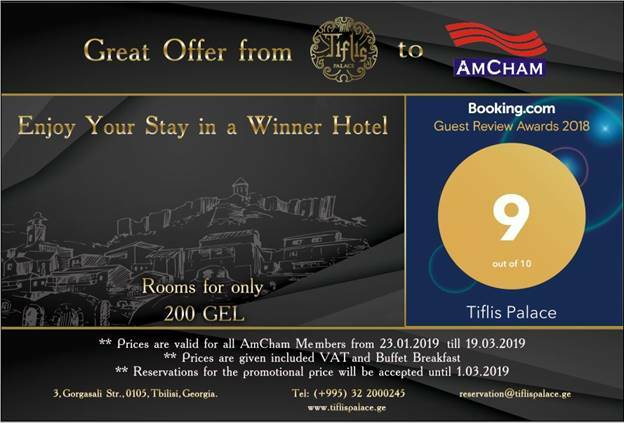 Only "Tiflis Palace" features all in one: Ideal location in the heart of old city center; The best picturesque and breath-taking views; International standards of service quality; Great Conference facilities; Attentive professionals with a passion of hospitality. Tiflis Veranda is a combination of a high quality classic restaurant and summer terraces. It offers exquisite dishes of local and international cuisine, exclusive desserts and brand cocktails, high quality of service, accompanied by nice background music. Surrounded by the breathtaking views of the city�s most important historical and cultural monuments one can See, Feel and Live the History of Tbilisi. The Grand Gloria Hotel is the only hotel in Batumi, located on the very first line of sea coast. Hotel houses 167 spacious rooms with Beautiful balconies overlooking the sea; Spa center, Outdoor and Indoor Swimming pools, Restaurants with amazing sunset view spread on 12 floors. The Grand Gloria boasts state of the art facilities that make it the choice spot for lodging and relaxation. With the presence of all these facilities, the Grand Gloria hotel is the best choice for a beautiful and memorable summer vacation. GM Capital is a consulting company that provides wide range of services for various industries including hydro and solar power plant construction, maintenance and operations, chemical plant operations and maintenance, etc. Applying specialists across a broad range of high speed rotating equipment such as compressors, turbines and pumps, the company enables safe, reliable and cost-effective solutions throughout the lifecycle of customers' facilities and assets. Using the experience in operating plants and overhauling and maintaining rotating equipment, GM Capital delivers O&M strategies to enhance operational performance and system reliability of industrial assets. Skilled operations and engineering teams provide equipment maintenance solutions to minimize downtime, increase availability and reduce overall operating costs. GM Capital also provides financial and industrial plans including financial planning, budgeting, reporting, accounting, VAT reconciliations, taxation issues, payroll control, etc. Company helps to improve procurement process by organizing and participation of all major international suppliers of equipment and consumables in the tender process and ensuring the transparency of the entire process. GM Capital also provides services to facilitate the sale of the output both on internal and international markets. GMC Motors was established in 2013 as an official distributor of Shandong Lovell Heavy Industry International Trading Co., Ltd. Today GMC Motors is a distributor of many companies and it sells famous brands of Massey Ferguson (AGCO), Emerson Electrics UK Limited t/a Incinerator, Lovell, Futon, Dong Fang, Arbors (Goldoni), CHL, Helix, Sigma and many others. The company is well-known for its professional sales and after-sales support in the market. The company has a good reputation for efficient sales and professional after-sales support. Gvinadze & Partners is a leading Georgian business law firm. With its predecessor firms Georgian Consulting Group (GCG Law Office), Ernst & Young Legal (EY Law Georgia), Gvinadze & Partners and then most recently DLA Piper Gvinadze & Partners, it has over 15 years of successful history of serving and promoting inward investment in Georgia, and is widely recognized as the highest quality legal service provider in the country. With its leading position in the Georgian cement market, HeidelbergCement Georgia operates 4 cement plants in the Kaspi, Rustavi (2) and Poti Regions. HeidelbergCement employs more then 1200 people in its production companies in Georgia: "HeidelbergCement Georgia" (former "SaqCementi") and “Kartuli Cementi”. Beside the cement companies, HeidelbergCement successfully operates in concrete business line and owns production company "HeidelbergBeton Georgia". Today HeidelbergCement runs 9 concrete plants in Georgia. Herbalife Nutrition is a global nutrition company. Herbalife Nutrition was founded in Los Angeles in 1980 and operates today in more than 90 countries worldwide. Herbalife Nutrition is the publicly traded company on the New York Stock Exchange with more than 7,400 employees and millions of customers. The company reported net sales of $5 bilion in its full year 2014 financial filings. Herbalife Nutrition is committed to helping fight obesity and poor eating habits by offering high-quality products, personal high-touch coachingm and a social environment that inspires customers to eat better, maintain a healthy weight, and pursue a healthy, active lifestyle. Hualing International Special Economic Zone in Tbilisi, Free Industry Zone in Kutaisi, forest harvesting, wood processing, mining development, banking. Hydrolea LLC is focused on developing, constructing and operating small to mid-size HPPs in Georgia. TNT is an international courier delivery services company with headquarters in Hoofddorp, Netherlands. The firm has fully owned operations in 61 countries and delivers documents, parcels and pieces of freight to over 200 countries. The company recorded sales of €6.91 billion in 2015. ILF Beratende Ingenieure ZT Gmbh Branch in Georgia is a branch office of well reputable Austrian-German company. Ilf is implementing the following projects in Georgia: Georgian Railway Modernization Project, Tbilisi Railway Bypass Project, Nenskra Road Project, Anaklia Seaport Development Study, Gardabani Combined Cycle Power Plant Project, Water Infrastructure Modernization Project in 17 cities of Georgia. Celebrating more than 25 remarkable years in Caucasus, InterCo Travel Group has established an enviable reputation as a group of the full service destination management companies, hand crafting and coordinating complex outbound and inbound itineraries, covering all logistics, transportation, accommodation and the insider access to unique experiences. International Black Sea University Ltd.
International Black Sea University (IBSU) founded in 1995, IBSU is a University that has the objective of training Georgian and foreign students in scientific, technical and professional fields of study, and of utilizing these studies in the field of pure and applied research for contributing to the economic and social necessities of Georgia and other developing countries. Since its inception the language of instruction has been English. Exchange programs, study visits, trainings, summer schools and excursions abroad are offered to students, according to their GPA and engagementin social activities. University has a wide partnership network all over the world. In 2012, the Bank was registered by the National Bank of Georgia (NBG) and began its operations as a Branch of a foreign entity namely, T?rkiye ?? Bankas? A.? Batumi Branch. In August 2015, JSC Isbank Georgia - a fully owned subsidiary of T?rkiye ?? Bankas? A.?. - was established and took over the operations of its parent company in Georgia serving commercial as well as individual clients with a wide variety of banking products and services. The Bank is operating with one branch in Tbilisi, one branch and one service center in Batumi. JTI - Japan Tobacco International is the international tobacco business of Japan Tobacco Inc., a leading international tobacco product manufacturer, with a global market share of almost 10%. Law firm providing legal services to georgian and Internationalm Companies. Established in 2002, Liberty Bank (GSE: BANK) is the sixth largest bank in Georgia by total assets, with a 5.2% market share as of 30 November 2010 (up from 3.5% as of 30 September 2009). Liberty Bank has the largest branch network in Georgia, comprising 191 branches, and serves approximately 1.2 million individuals and over 26 thousand legal entities. In September 2009, Liberty Capital purchased a controlling equity interest in Liberty Bank and commenced its turnaround. Legal Partners Associated - LPA LLC is a full-service law firm providing legal advice and counseling in broad aspects of business and financial transactions, corporate, civil and administrative law. Luca Polare (G&G Cooperation) is the leading ice cream and coffee chain in Georgia, with four shops in Tbilisi. It serves finest Italian ice cream, delicious coffee specialties and luscious freshly baked cakes. All products are homemade in Georgia … with inspiration and love. Militzer & M?nch's founders were pioneers 130 years ago when they set up their rail freight forwarding company. Pioneering spirit also moved the Militzer & M?nch experts to venture into airfreight as early as the mid-1950s, and then to add groupage transports via road and rail from Germany to such remote destinations as Iran and Afghanistan. Militzer & M?nch proved its foresight, its pioneering spirit, and its courage again when it was among the first companies to successfully establish itself in the new, promising markets of Eastern Europe, Central Asia, and China, thus paving the way for its clients. Being one of the major international investors in Georgia, Maqro Construction is continuing to live a mark on Georgia through various investments it has made in short time since it was founded in 2013. Maqro Construction develops its technical expertise based on honesty and high quality which are the main features of its business ethics, together with the right strategy of its dedicated management team that monitors the market closely. By this means, it provides its costumers comfortable services, products and brand-new contemporary living areas with unique and affordable terms in addition, it is a close follower of this new lifestyle that it creates. Maqro Food LLC "Dinehall" is the first fresh casual café restaurant, which is located on 28 Rustaveli Avenue. Dinehall combines five venues in one - café and restaurant, bar, wine cellar, patisserie and art gallery. Dinehall's expo halls are perfect for private companies and individual events. Dinehall's concept is "Less is More", company's philosophy is "Good Food is a Human Right", company's vision is to reach a global standard with customer and employee satisfaction, also to acquire competitive advantages in its industry by creating difference. At Mercure hotels, guests find an atmosphere, which makes every stay a unique experience. It is run by the teams of enthusiastic professionals. Mercure Tbilisi Old Town is infused with local spirit in harmony with people and unique surroundings. The hotel is uncompromisingly committed to offering both high quality and genuinely enjoyable hotel experiences here in Georgia. Based in the heart of Tbilisi, the company advises a diverse group of Georgian and foreign companies, financial institutions, investment funds, governments and public enterprises. MG Law leads the market with its unique expertise, at the same time boasting of its history of exceptional international legal advice. MG Law team includes some of the market's leading advisors on both domestic and cross-border corporate, energy, and financing transactions, and domestic and international dispute resolution in the region. MG Law recruits lawyers with diverse academic and professional background. The lawyers are qualified in multiple jurisdictions, including Georgia, the United Kingdom, the United States, France and Canada, and experienced with varied legal systems, including that of the United Arab Emirates. MG Law is fluent in several languages, including English, Russian, Georgian, French, and Italian. Among many other areas, the strengths of MG Law's varied and accomplished experts primarily focus on the following sectors: Banking & Finance, Capital Markets, Arbitration & Litigation, Labor & Employment, Infrastructure and Project Finance, Energy Law, Real Estate, Tax and Customs, Investment Law, Corporate Law, Real Estate, Infrastructure & Finance Projects, and Cryptocurrency & Blockchain. Mgaloblishvili Kipiani Dzidziguri (MKD) has been at the forefront of the Georgian legal market for two decades. As MKD marks its 20th anniversary this year, it has emerged as a strong, highly competitive, well respected and pre-eminent Georgian law firm that provides a full range of legal services to its global clients. The performance of MKD lawyers and professionals translates into client satisfaction, as the real measure of the firm’s success. The firm is proud of the external recognition it has gained through client assessments in a range of international research-based guides for the legal profession, which in 2016 again recognized MKD as one of Georgia's leading law firms. JSC Mina is the producer of glass containers in Georgia. The factory dating back to 1987, was acquired by Sisecam, one of the global leaders in glass production, at 1998. Being one of the first FDI’s in Georgia, the company went through an intensive period of modernization. Since then its Ksani Factory supplies majority of Georgian companies manufacturing mineral waters, wine, soft drinks and beer. Recently the company increased its production capacity by investing in the state of the art modern equipment and furnace to produce high quality products in various types and colors, standard and exclusive designs. The company’s aim is to provide world quality glass packaging to Georgian market to add value to various sectors’ success and growth, in particular, mineral water and wine sectors. JSC Mina holds ISO 9001:2008 Quality Management Certificate and ISO 22000:2005 food Safety Certificate. Implementation of new procedures has improved production control and quality management unified system, as one of the most major goals of the company. Mira Hotels operates a brand Hotel River Side Tbilisi which is located in historical, commercial and architectural center of Tbilisi. Within walking distance of the city's business district, major attractions and retail hub, making the hotel an ideal base from which to explore the city or conduct business. You will feel at home, and at the same time will enjoy the luxurious hotel comfort. Mira-Hotels also operates first official Tiffany Bar which offers a chic, stylish look and feel. With beautiful opulent pieces of furniture and a menu that includes creative cocktails and culinary wonders masterfully created by our Chef. Food and drinks are served throughout the day, starting with Continental breakfast in the morning and continuing with a full menu of lunch, snack and dinner option into the evening, accompanied by live jazz performances every Thursday-Sunday. River Side Hotel with Tiffany Bar won prestigious Travelers’ Choice Awards 2015 and 2016 by Tripadvisor Inc. Are HACCP certified and members of American Hotel and Lodging Association (AHLA) Head Office in Washington DC. Murphy Bridge is representative company of Murphy Shipping and Commercial Services Ltd. or MSCS for short, which is a UK-based organization and operates on market for more than 42 years. In nearest future Murphy Bridge plans implementation of 12 projects in Georgia. Company's goal is the construction of moderate logistic centers with comprehensive services and their operation. Murphy Bridge will include full-scale customs clearance, warehousing and terminal services, also Truck Park, laboratories, accommodations, etc. The logistic center will relieve traffic jams of trucks and chaotic movements on the road in most attractive region of our country for tourism. Despite of infrastructure and environmental issues the company leadership believes that by acceleration the flow of transit their project will contribute to import and export growth in the region. MyGPS being a pioneer in Georgia for vehicle fleet management systems since 2007 introduced fuel consumption measuring solutions and software development to Georgian Market. The company has expanded its activities to cover railway dispatching and monitoring solutions, remote control of melioration and irrigation systems, municipal transport management solutions, fuel consumption and routing optimization systems. After 3 years of intensive R&D, in 2015 MyGPS introduced LED outdoor lighting system of its own technological design and launched its production in Georgia under the brand MLED. The company uses LEDs form American company CREE, which has tested MLED products and due to its impressive results and reliability, authorized MyGPS to use CREE LEDs band on its products or promotional activities. MyGPS has already installed hundreds of LED lightings in several municipalities throughout Georgia and is in the negotiations with governmental offices to advocate for full replacement of old inefficient lighting solutions with breakthrough technology that can save tens of millions of public resources. MyGPS is exploring the opportunities to start exporting MLED lightings to US market. A mission of the National Center for Dispute Resolution is to establish Alternative Dispute Resolution system and provide full range of ADR services in Georgia. Working closely with the Government and the Parliament of Georgia the center will be assisting them in establishing quality ADR system througn offering its expertise and assistance in creation of a code of ethics for mediators, code of conduct and procedures of mediation and etc. The center also provides educational and training programs for individuals, organizations and government parties in all fields of ADR, Facilitative and evaluative mediation, transformative mediation, neutral case evaluation, settlement conference, neutral expert fact finding, special master, facilitation, negotiation, discovery referee, project neutral and dispute review board services. National Center for Dispute Resolution (NCDR) offers select seminars, trainings, workshops and external educational programs that aid organizations and individuals in developing, mastering and improving their dispute resolution skills. NCC is a construction company delivering high quality products in 3 main directions: construction, engineering and building materials production. Management of the company consists of professionals having management experience in urban infrastructure development, residential construction and communication infrastructure. Quality management has a high priority at NCC: technical department supervises the ongoing works and responds quickly to any mismatches of the project design or requested quality. Concrete quality is checked by independent chemical laboratory on permanent bases. There is a responsible person for safety in NCC who is developing safety instructions for all kind of works and is arranging permanent training sessions for personal. With sufficient construction equipment and machinery, own concrete and inert materials factory, offices and warehouses, the company has all the necessary means to carry out its duties successfully. All of these factors make NCC successful Company with a growing number of projects and revenues. Nexia International is a leading top 10 worldwide network of independent accounting and consulting firms. Founded in 1971, for now, NEXIA’s network unites 614 offices in more than 110 countries. All independent member firms apply strict procedures and standards and are subject to regular quality control reviews which must be met as a condition of continuing membership of Nexia International. Services provided: audit, International Financial Reporting Standards (IFRS), accounting outsourcing, tax, consulting, tax dispute solutions, legal, valuation, transactions, reporting & budgeting, business plans. Nodia, Urumashvili & Partners was founded in 2005 and soon, the Company came to the front as one of the leaders in the field of legal advice provided to major industrial and commercial entities. The Company's practice is supported by the legal pros in charge of the local and international business, which possess the truly balanced knowledge of distinctions of the various fields of law both within the local and international environment. Nutrimax (former Agro Trading Georgia) successfully operating in Georgian market since 2009 and its purpose is providing small and medium range farmers’ animals and poultry with the highest quality feed, feed additives and support with modern feeding methods as well. The consumers of Nutrimax are small, medium and large-range farmers. The company offers to farmers compound feeds, as well as the best quality premixes and concentrates for growing poultry and cattle for effective agricultural purpose. The farmers also have the opportunity to receive free consultations in order to improve their productivity. Nutrimax is constantly striving to maintain close contact with the young people, who are in the field of veterinary or zoo-technical branch in order to get acquire knowledge, help them to find their place and to maximize their own potential. Overall Management Group (OMG) Inc.
OMG International comprises several companies engaged in official wholesale and retail distribution of leading global mobile communication products and services, GSM and DECT devices, mobile content, personal care, professional cosmetics, laundry detergents, and household cleaning consumer product brands in Azerbaijan and Georgia. "Telefon Georgia" is the official distributor of Sony Ericsson mobile phones and has a multi-brand retail network "Telefoni" and an authorized service center "GSM Service" in Tbilisi. Paine Stevens is a regional law firm based in Georgia, providing English law services to clients on international transactions in the Caucasus and Central Asia. The firm advises on finance, corporate and commercial matters. Pasha Bank is a Baku-based financial institution operating in Azerbaijan, Georgia and Turkey, providing a full range of corporate and investment banking services to large and medium-sized enterprises. Pasha Bank Georgia JSC is a regional bank, which is a part of Pasha Holding - a diversified investment group with interests in banking, insurance, property development, construction, tourism and other sectors. As of December 2014, the total assets of Pasha Holding are approximately EUR 3 billion. Pasha Bank Georgia JSC has been operating in Georgia since 2013. As of December 2015, the Bank’s total assets exceeded GEL 278 million. Policy and Management Consulting Group – PMCG is an international development company specializing in policy advising, capacity building, infrastructure development, maximizing investments, and corporate management. PMCG specializes in policy advising, institutional building and capacity development, monitoring and evaluation, infrastructure development and corporate management consulting. Company Ltd Primera Residence Development and Construction is planning to develop on the existing land territory under its ownership, a large scale residence district with the appropriate infrastructure including residential trading facilities, hotels, schools and kindergartens. At the same time, it is planned to create a sport and fitness complex, which will include a Golf Course of international standards. Publicis ZenithOptimedia is a full service commercial agency. Its services include strategy planning, brand-consumer connections, event management, media planning and much more. Qebuli Climate JSC, which was known as Termarsenal Ltd, was founded in 2005 with the purpose to provide companies and government organizations with price reasonable solution of heating, conditioning, ventilation and water supply systems and also implies installation of these systems. Company is the official distributor of Bosch Thermotechnik and Grundfos Pumps in Georgia. Qebuli Climate's head quarter is located in Tbilisi, Beliashvili street 40. The central warehouse with the size of 4,000 square meters contains more than 1500 product categories. Also, the company is represented in Georgia’s 8 largest cities (Tbilisi, Kutaisi, Gori, Zugrdidi, Telavi, Rustavi, Batumi, Poti) with 11 branches and has the large dealer network in Georgia. Rakeen is the largest development company in the Ras Al Khaimah Emirate. Since 2006 Rakeen Development implements innovative and large-scale projects in Georgia, such as: Uptown Tbilisi in Dogomi district and Tbilisi Heights in Tabakhmela. Some of the upcoming projects are in Vardzia, Batumi and Gonio. The main goal of Rakeen Development is to introduce new lifestyle standards and to develop a world class tourist infrastructure in Georgia. Regus is the world's largest provider of flexible workspace solutions, with customers including some of the most successful entrepreneurs, individuals and multi-billion dollar corporations. Regus network includes almost 3000 business centers, spanning almost 900 cities across 120 countries. Through the range of office formats, as well as company's growing mobile, virtual office, and workspace recovery businesses, Regus Enables people and businesses to work where they want, when they want, how they want, and at a range of price points. Regus 1st centre in Georgia is located in the very heart of the capital, the Freedom Square. Tabidze 1 Building, 2 Leonidze st. 4th floor. Rentals LLC is a specially designed real estate agency to focus on residential and commercial rentals. Although the company is relatively newly established (2009) it already has a sound track of success and even more important- a great number of loyal corporate and individual clientele. Rentals LLC is one of the most recallable companies among the expat society based in Tbilisi. The company closely cooperates with the majority of Embassies and International missions accredited in Georgia. Resolution Insurance Brokers was originally founded in Armenia in 2000. Resolution Insurance Brokers, Georgia (RIBG) was established in 2011 as a separate registered insurance and reinsurance broker. Its business is founded on being able to deliver value, service and integrity to all its clients through m eeting their insurance needs. A core strength of the company is providing complex, bespoke, corporate client insurance solutions to commercial and professional businesses, with a strong FDI focus. RIBG has excellent long term relationships with the principal dimestic insurers and international brokers. The company works in all direct and reinsurance classes. Set in the heart of Tbilisi’s neighborhood, Vera, Rooms Hotel Tbilisi’s doors are open to anyone willing to get an invaluable experience. It is so much more than a 141 guest room hotel. It is a destination of its own. Architects of this project have successfully transformed this former industrial building of an old publishing house into a contemporary 5-story hotel. The essence and history of the building is retained, capturing the raw post-industrial and offbeat bohemian vibe that has come to define this part of the capital city. Everything has a regal sophisticated feel blended with a touch of tasteful modernism. Rich with character it is designed for a flawless and comfortable stay. Everything here is delightfully unique and inspiring that oozes class and sexiness. Neighborhood offers laid back hangout. Authentic experiences obtained at Rooms Hotel Tbilisi cannot be recreated any place else. Surely, there is a certain distinct New York sensibility to the Hotel. Here you will encounter a contrasting crew of corporate types, artists, musicians and other creative people who congregate to eat, drink and socialize. RSM Georgia is an independent member of a global network RSM, which is the 6th largest network of independent audit, tax and advisory firms in the world and the fifth largest firm in the U.S. The network comprises of more than 43,000 staff working across 800 offices in 120 countries. The company is in each of the top 40 major business centers throughout the world. Clients of RSM Georgia range from growth-focused entrepreneurial businesses through to leading multi-national organizations across many sectors and operating nationally and across borders. As an integrated team, the company shares skills, insight and resources, as well as a client-centric approach that's based on a deep understanding of client's business. RSM Georgia offers its services in four main offices in Tbilisi and branch offices in Batumi and Kutaisi. Since 2012 RSM has been a leading sponsor of European Business Award, Europe's largest and most significant cross-sector business recognition program. Silknet LLC was founded by United Telecom, Wanex (optic-fiber provider) and Adjara Elektrokavshiri (incumbent provider in Adjara Region). Silknet is the leading provider of telecommunication services to carriers and providers in telecom industry in Georgia, with an authorized capital of 164,171,901 GEL and total of 3,878 employees within Georgia. The major services provided by Silknet includes: Fixed Telephony (PSTN)c. 400,000 subscribers, Internet (DSL) c. 100,000 subscribers, Wireless Telephone (CDMA) c. 60,000 subscribers, Interconnection service 8-16, IP-Television (planned from June 2010), VPN net projection and installation, Carrier Services. The Silk Road Group (SRG) has enjoyed significant growth in Central Asia. SRG's success is attributed to its high quality service, provided in a challenging environment. SRG has done this through: Secure and reliable service based on regional relationships and experience; Tracking, tracing, and reporting technology; Scalability, capacity, and flexibility to meet client needs and growing demands. Turner Broadcasting Systems Granted the right to the T3Concept Ltd. to represent, negotiate and sign license agreements for distribution of CNN, Cartoon Network and Boomerang channels on behalf of Turner on territory of Georgia, Armenia and Azerbaijan. As the wholly Owned Subsidiary of Time Warner Inc. Turner creates and programs branded news, entertainment, sports, animation, and young adult multi-platform content for customers around the world. T3Concept amongst other activities works to improve the brand competitive position in the market and with Turner strives to defend the intellectual property rights against piracy and unlicensed copying and distribution as well as working for brand extension and recognition throughout territory. JSC TBC Leasing was established in 2003. The list of TBCL clients vary from medical, printing, transportation companies, food and processing industry, to service industry and trade, as well as some agricultural companies all across Georgia. Prompt and flexible service makes TBCL products attractive for both newly established yet developing and accomplished large companies. The company constantly strives to develop partnership with different local vendors and thus offer clients flexible new products tailored to their needs. Tbilisi View Ltd. has been operating on the Georgian market of real estate construction since 2010. Development and construction of residential complexes on a turnkey basis is the main activity of the Company, which covers all complex of construction and fine finishing works as well as post-construction utility services provision for the completed projects. Today the company's projects are located in Tbilisi. The company implements modern technologies in development and construction of real estate as well as in optimization of business processes at all stages of property development. Tbilisi View Ltd. provides Georgians with the modern qualitative dwelling that meets all international norms of construction and provides our clients with the new quality of life. After 17 years of banking operations Kor Standard Bank enters into the market under the new brand-name. Terabank - different conception of banking service to customer cozy environment. Key reason for starting the re-branding was to take customers interests into account. In 2015 the bank’s business strategy was changed and the main target is the SME business. Accordingly, it became necessary to change the bank’s image, communication style and the interior, in order the good quality banking service to be provided to the mentioned segment in a comfortable environment for them. Bank’s re-branding was supported by the shareholders and the supervisory company - Dhabi Group. The main shareholder of Terabank is Sheikh of the UAE - Nahayan Mabarak Al Nahayan. Nahayan owns the investment of USD 250 million in Georgia and, as we are aware, he intends to increase this amount. The company has been importing and distributing heating, ventilation, and air conditioning systems. Terma JSC quickly became the exclusive local importer of well-known international brands with a strong distribution network. Exquisite desin and timeless elegance of 26-room The terrace BoutiqueHotel is housed in the heart of Tbilisi's historical center. Providing a unique blend of personalized attention and essential elements for unforgetable city break, the Terrace Hotel's team is committed to providing an exceptional experience to each and every guest. Theco limited is an international company with a wide experience in the sphere of construction and design. Transporter LLC in headquartered in Tbilisi, Georgia. The company was founded in 2015. In 2016, Transporter became an official distributor of Bombardier Recreational Products (BRP) and all of its brands (Evinrude, Can-Am, Can-Am Spyder, See-Doo, Lynx and Ski-Doo). In March, 2017 Transporter signed distributor contract with Brunswick Boat Group, in 2017 the company became official distributor of MND Group, Kawasaki Motors, Italcar, Jobe Watersports, Zodiac Nautic, Grand Boats in Georgia. In 2018 the company became authorized dealer of Pistenbully, distributor of Husqvarna and Volvo Penta. Furthermore Transporter LLC is at a final stages of becoming distributors of Textron Specialized vehicles, which is U.S.-based major manufacturer of recreational and other special purpose vehicles, Textron Inc.
Transporter LLC offers its customers: snowmobiles, ATVs, SSVs, personal watercraft, golf carts, electric vehicles, pleasure boats, boat engines, bicycles, spare parts, water sport products, accessories, apparel and mountain resort development solutions. Transporter LLC currently runs 3 showrooms, one in the capital, Tbilisi, on in the four season resort Bakuriani and one in the sea side resort Batumi. besides these showrooms, Transporter LLC operates Service center with certified technical personnel who qualify for the highest standards possible in the industry. Transporter LLC mission is to maintain a leading position as a distributor of recreational, utility and sport vehicles and other products in South Caucasian region. The company strives to expand its presence and operations in the region and promote quality healthy and adventurous lifestyle within its customers. The goal of the company is to offer all its customers reliable, high-quality products and provide first class service. The main advantage of the company is its highly qualified experienced personnel and an unceasing desire to improve and grow as a business. University of Georgia (UG) is the largest private educational institution in Georgia. Throughout the past decade, the improvement of the quality of education in Georgia has been one of the top priorities. In this framework, the aim of UG has always been to develop and maintain high academic standards, as well as a high quality of student life, for the benefit of both its students and community. UG offers a wide range of courses and programs, containing faculties of: Law, Business, Economics and Management; Health Sciences and Public Health (including nursing, dental, pharmacy); IT, Engineering and Mathematics, Social Sciences; and Humanities. UG has assambled laboratories, IT rooomsm simulation courtroom, and historical facilities to create a superior learning environment where students are able to gain theoretical knowledge and develop practical skills. Veziri Ltd. was established in 1996 as communication and security systems integrator and products supplier for Georgian Market. Initially the company started its activities with supply and installation of conventional RF systems and later diversifying into other communication media. In 2008 Veziri Ltd. was awarded with an ISO 9001 : 2000 Quality Management International Certificate; in 2010 Veziri Ltd has successfully passed Quality Management System Audit and was granted with ISO 9001-2008 International Certificate. The success has been achieved through the knowledge and experience of professional managers and technical staff, whose qualification trainings constantly are being improved in the headquarters of our partners. Veziri is a unique Company which has an opportunity to accomplish really scalable & complex projects. It has high-qualified technical team, which provides all services beginning from site survey till after sale support according to customers’ requirements & possibilities (potentialities). The implementation of the Company products is conducted according to the field International Standards and customers’ requirements as well. Nowadays, Veziri Ltd. is considered as one of the leading Communication and Security systems supplier and integrator on Georgian Market. The company provides design, supply, installation, commissioning, maintenance, customer training and after sale support fully meeting customer requirements. Project implementation on high level is caused by offering to customers Worlds’ famous brands’ products. Veziri Ltd. gives priority to all projects concerning Country Development. Company considers its civil responsibility – participates in charity activities, supports refugees and socially vulnerable groups. Designed as an affluent Georgian home, with great love and care for each detail, Vinotel will engulf you with beauty and comfort. With Vinotel, you will discover the rich world of Georgian wine, sample the unique tastes of Georgia with the world-class chef, and live the sense of Georgia’s history. In Vinotel you will find a harmonious synergy of unique antiques gathered throughout Georgia with the comfort of modern technology. Vinotel is an excellent example of traditional Tbilisi architecture, with its ornamented balconies and brick cellars dating back to 1880s. Garden glass facade was added in 2005 as a modernized version of the original window panes. Vinotel welcomed its first guests in 2015. Wings & Freeman Capital Ltd. was established in January 2009. It is an advisory firm specializing in project financing in various sectors of Economy. Their mission is finding financial solutions for local businesses in Georgia to develop and grow. Particularly the Company works to identify attractive investment opportunities in Georgia and to attract cross border financing for such projects. The forms of financing include: (a) FDIs performed by Private Equity Funds; (b) Loan Facilities; and (c) Export Financing for the goods and services purchased in Europe or in the USA. Wings & Freeman Capital acts as a project underwriter overseeing the entire process starting from a pre-feasibility stage to obtaining the financing from various IFIs and Private Equity Funds. Wissol Georgia is one of the biggest business groups in Georgia involved in different sectors of the local economy. In the energy sector Wissol is represented through its sub-brands: Wissol Petroleum, Wissol Gas, Air Wissol, Wissol Bunkering and Wissol Gas Distribution Company. JSC Wissol Petroleum Georgia owns the largest network of branded service stations nationwide. The company has over 100 licenses for petrol stations in its portfolio. Wissol secures stable supply of the highest quality unleaded petroleum products from the Italian producer - API. The company conducts its operations and constructs and maintains its service stations and reservoirs in compliance to the international environmental standards. Compressed natural gas (CNG), the environmentally friendly fossil fuels is available at Wissol's integrated service station since September, 2007. Innovative thinking is an asset of the company. Wissol was the first company in the industry who pioneered chip-based cards for corporate clients in 2001. It was the first company who introduced loyalty PIRVELI cards for individual clients as well. In 2009 Wissol received an ISO 9001:2008, having held the ISO Quality Management Certificate since 2006. Zarapxana LLC is a jewelry company. The name Zarapxana exists since 2008, however the company exists since 1939 and was known as "Jewelry Factory". Company sells products in 5 stores across Georgia. In addition to this, the company produces approximately 300 different types of souvenires and accepts individual orders. Agricultural University is Georgia’s primary institution of higher education for agriculture and related fields. The university has a history stretching back to 1929 and is the umbrella institution for more than 17 distinct research institutes and laboratories engaged in a wide range of activities throughout the country. In March, 2011, the university became a private, not-for-profit university owned by the Foundation of Agricultural Education and Science. Since then, the university has undergone extensive renovation and now boasts fully equipped facilities, including state-of-the-art laboratories for education and research. Much of the academic faculty has experience studying and working in institutions of higher education and research in the USA, Europe, and elsewhere. Agricultural University seeks partnerships with universities, research institutes, private enterprises, and other organizations engaged in education, research, and innovation in agriculture, engineering, and related areas. American Friends of Georgia, Inc. (AFG) is a non-profit, non-political U.S. charity. Since 1994 years it has helped establish and maintain groundbreaking and innovative projects for abandoned, disabled and sick children and elderly. AFG also preserves and promotes Georgian culture and collaborates with Georgian and foreign businesses to restore the tradition of philanthropy. Care is one of the world's largest international non-governmental humanitarian organizations, committed to helping families in poor communities improve their lives and achieve victories over poverty. Care International in the Caucasus assists socially and economically disempowered individuals to realize their potential and find lasting solutions to their most threatening problems. CENN has been working since 1998 at the local, national and regional levels in the Caucasus region to foster modern and sustainable development values and practices. CENN works with the government to develop sustainable solutions to existing challenges, assists businesses to maximize profits while minimizing the impact on the environment and is innovative and pro-active to respond to environmental and socioeconomic concerns. With representation throughout the Southern Caucasus and more than 50 full time members of staff across the region, CENN has the capability and commitment to provide a service that is consistent , professional and of the highest quality. CENN delivers modern solutions for the public and business sectors and communities, assisting them in managing their environmental and related risks and helping them to achieve a competitive advantage through improved environmental and social performance. CiDA is a regional civil society organization established in 2002 in Rustavi, Georgia, which supports and promotes the social and economic rights of Georgian citizens by providing direct services and/or enables constituents to engage in networking opportunities to solve community problems. One of the principal directions of CiDA's work us coordination and development of the Regional Civil Society Network (R-CSN) connecting 64 CSOs from all regions of Georgia, established in 2013. R-CSN supports deepening of partnerships between civil society organizations, active citizens, local and central government representatives, political parties, donors, experts and media representatives. CiDA is one of the few organizations in Georgia, which has been working on promotion of international corporate responsibility standards among relevant stakeholders in Georgia, such as businesses, CSOs, Government and the general public. CiDA coordinates 2two corporate sustainability platforms in Georgia - Corporate Social Responsibility (CSR) Club and the United Nations Global Compact Network in Georgia. Both of those platforms unite business and non-business participants, encouraging cooperation of those actors, with the overall aim of promoting sustainable development in the country. CiDA is a leading CSO in Georgia in the field of capacity development of democratic and human rights institutions. Organization has been working with different vulnerable groups, such as probationers, children in conflict with the law, eco-migrants, IDPs, returned migrants, and assisting their re-integration into local communities through capacity building, personal development and economic empowerment. The Europe Foundation is a privately managed grantmaking organization dedicated to funding programs that build democratic and free market institutions in the twelve New Independent States (NIS) of the former Soviet Union - Armenia, Azerbaijan, Belarus, Georgia, Kazakhstan, the Kyrgyz Republic, Moldova, Russia, Tajikistan, Turkmenistan, Ukraine, and Uzbekistan. Free University is dedicated to pursue excellence in teaching by providing highest quality education and funding opportunities for the country's most talented students. Its unique scholarship opportunities along with the extensive outreach campaigns ensure that talented students from across the nation, regardless of their economic background, get the best chance of achieving success. Free University remains at the forefront of high quality education and is now the home of an elite learning community. Its undergraduate program emphasizes intellectual freedom, critical thinking, and creativity through a broad range interdisciplinary exposure to encourage leadership and entrepreneurship in the students. The University seeks to implement innovative teaching methods and set standards that meet those of world-class institutions while being dedicated to maintain Georgian as a primary language of instruction. The Red Cross Society is an impartial, neutral and independent organization whose exclusively humanitarian mission is to protect the lives and dignity of victims of armed conflict and other situations of violence and to provide them with assistance. The Red Cross Society also endeavors to prevent suffering by promoting and strengthening humanitarian law and universal humanitarian principles. The Good Governance Group in Georgia (G3) project addresses the diverse challenges facing governance at the national and local levels. The project was established in 2011 and aims to improve governance and transparency at the federal level promoting more responsive, expert, and engaged neighbouring governments. QSI International School of Tbilisi is a part of QSI International which is a non-profit orgaznization. Founded in 1992 as a member of Quality Schools International. The QSI International School of Tbilisi provides a quality education for students. SDSU Georgia will provide US-accredited bachelor's degrees in Science, Technology, Engineering and Mathematics (STEM) areas in Tbilisi. This program is funded through the Millenium Challenge Account - Georgia, and was made official via the Memorandum of Understanding between San Diego State University and the Government of Georgia signed in July of 2014. The forst cohort of students in Electrical Engineering, Computer Engineering, and Chemistry will be accepted in the Fall of 2015. Transparency International Georgia (TI Georgia) is a local non-governmental organization, member of global Transparency International movement, committed to combating corruption in Georgia through the promotion of transparency and accountability of relevant stakeholders. Our mission is to serve as the primary source of information on corruption reform in Georgia, to assist the Georgian government and the broader public in facilitating reform in sectors where corruption exists, to build and strengthen institutions and to promote good governance. In recent years, TI Georgia has become Georgia's leading advocacy-based think tank. Mission of UBL: to develop an outstanding network for successful entrepreneurs, to arrange events for the welfare of Women in Business like conferences, forums, masterclasses, training, etc. developing the role of women with families in entrepreneurship, educating young entrepreneurs who come from different backgrounds, to make them professionally capable of rising up in the competitive business world, to encourage and develop women oriented entrepreneurial projects, to arrange events including auctions to play a part in charity. Prior to moving to Georgia in 1997, Amy Denman worked in the Marketing & Sales Department of Houghton Mifflin, was a training consultant with IBM’s Eduquest Division and as a secondary mathematics teacher. Amy holds a Bachelor of Science degree from Vanderbilt University with a double major in both Mathematics and Psychology. Executive Coach, Leadership Trainer and Facilitator. International development professional working mainly in the area of agriculture and microfinance consulting. Currently works at Business and Finance Consulting. Based in the Caucasus since 2002, Hans works in policy research and consulting. Betsy Haskell is an 18 year resident of Georgia who started four successful businesses, and is currently developing a resort hotel and villas in the wine country. For the past 15 years, she has been the Georgia Contractor for Metrica, Inc, a US Treasury Department sub-contractor. Education & Training International Ltd.
Having retired from the U.S. Embassy in 2016 after 14 years of service as Ambassador's translator, Mr. Tsiklauri first registered as a sole proprietor and in 2017 founded GT Language Services LLC. The major area of activities of Mr. Tsikaluri and his company is interpreting and translation with overwhelming majority of his contracts being funded either by USG of affiliated entities. The Dow Chemical Company (Dow) combines science and technology knowledge to develop premier materials science solutions that are essential to human progress. Dow has one of the strongest and broadest toolkits in the industry, with robust technology, asset integration, scale and competitive capabilities that enable it to address complex global issues. Dow's market-driven, industry-leading portfolio of advanced materials, industrial intermediates, and plastics businesses deliver a broad range of differentiated technology-based products and solutions for customers in high-growth markets such as packaging, infrastructure, and consumer care. Dow is a subsidiary of DowDuPont (NYSE: DWDP), a holding company comprised of Dow and DuPont with the intent to form three strong, independent, publicly traded companies in agriculture, materials science and specialty sectors. Alexander Shapovalov is an independent business consultant, member of the Board of Directors of Georgian Franchise Development Association ( GFDA ). Sally White has spent over two decades building projects and analysing the financial and commercial markets of Eastern Europe. Based in London and Tbilisi, her background includes consultancy with the London Business School’s Economic Forecasting and Central & Eastern European Centres, and with Russian consultants and fund group Denholm Hall. She has also worked as BBC financial editor, as equities analyst at Credit Commercial de France, BNP Paribas and Laurence Prust, City Editor of the London Evening News, The Times investment editor and content writing for a number of financial websites. Now semi-retired, Sid has 40 years of experience as a practicing Economic Development professional.